In a recent exchange of letters with Congressman Ron Kind, Wisconsin Governor Scott Walker wrote that “we do not need to take the Medicaid expansion under Obamacare.” Is Walker right? Rather than take the federal money to expand Medicaid, Walker adopted a unique plan that eliminated Medicaid coverage for those recipients who made more than the federal poverty level (mostly parents), thus making room for people making less than that (mostly adults without children). Those pushed out were expected to seek insurance through the federal insurance exchanges set up by Obamacare, as Walker also refused to set up a state health insurance exchange. Many, including Kind, have suggested Walker did this for political reasons. As described in last week’s Data Wonk column, Walker’s maneuver was successful in reducing the number of people without insurance. 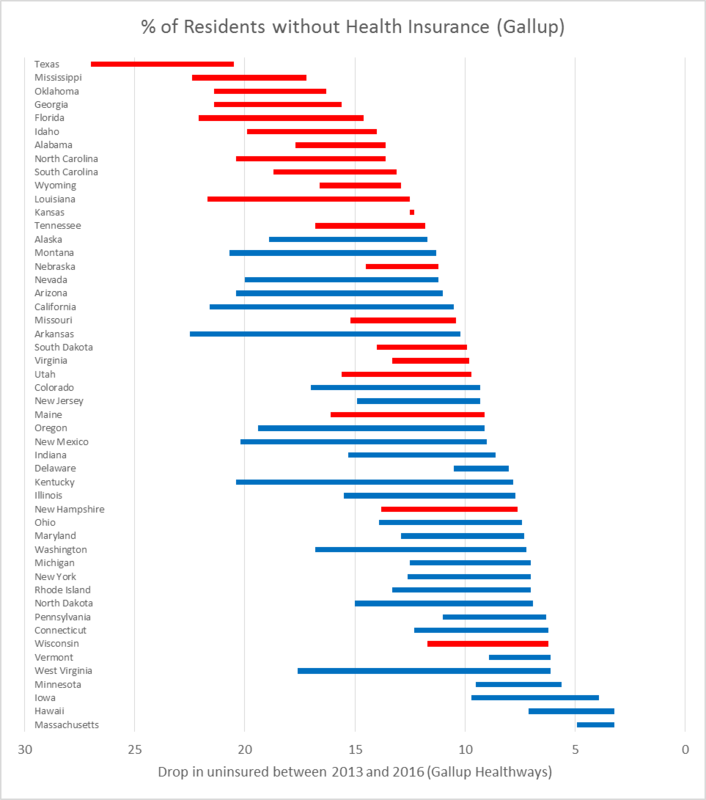 Gallup’s state results are summarized in the chart below, showing the drop in the uninsured rate between 2013 (the left-hand end of each bar) and 2016 (the right-hand end). States expanding Medicaid are shown in blue; those refusing the federal funds in red. Your oversimplified suggestion would use federal taxpayer dollars to shift people from coverage in the private marketplace to a government-run system. This would subject Wisconsinites to the whims of Washington D.C. This comes with a certain irony. Who does he think runs the federal insurance exchanges his approach has relied on? As to the “whims of Washington,” the recent Trump–Ryan proposal to replace Obamacare would have made insurance purchased through the exchange unaffordable to many people just above the poverty line, particularly to those in their 50s or 60s. The non-partisan Legislative Fiscal Bureau has estimated that the cost to Wisconsin taxpayers of turning down the federal funds is around $200 million per year. The foregone funds could have helped reduce program cuts or even reduced Wisconsin taxes. This is the main point that Kind made in his letter. He referred to a billion dollar cost, which is the total over six years, from 2013 to 2019. Kind also refers to a projected shortfall of over $1 billion in the current budget bill, which presumably covers two years. The casual reader might come away with the overly optimistic impression that accepting the expansion funds would solve Wisconsin’s budget problems. Accepting the funds would reduce the gap, but not fill it. Some defenders of turning down the expansion funds argue that while doing so might be bad for Wisconsin taxpayers it is good for federal taxpayers who pay over 90 percent of the expansion. The chart below shows the Legislative Reference Bureau’s calculation of the state cost (in blue) and the federal cost (in orange) of the current law and of full implementation. I find this argument odd philosophically. Essentially it demands that Wisconsin make decisions based on whether they agree or disagree with federal law, rather than what is good for Wisconsin given current federal law. This argument also ignores the cost to federal taxpayers of the subsidy to make make health insurance purchased on the federal exchange affordable — which Walker’s approach relies on. 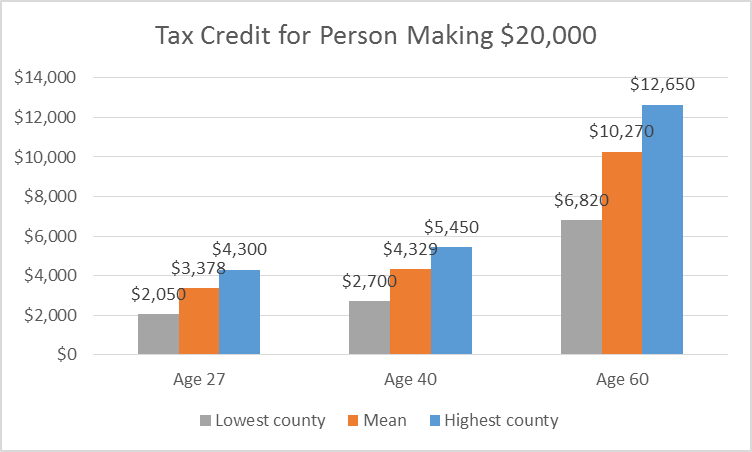 The amount of this subsidy — provided through a tax credit — varies widely depending on the person’s income, age, and county. The graph below shows the range of annual subsidies In Wisconsin for someone making $20,000, which probably best describes the people who moved from Medicaid to the exchange. Averaging the means for the three age categories gave $497 million as an estimate of the additional subsidy for those forced to use the exchanges. 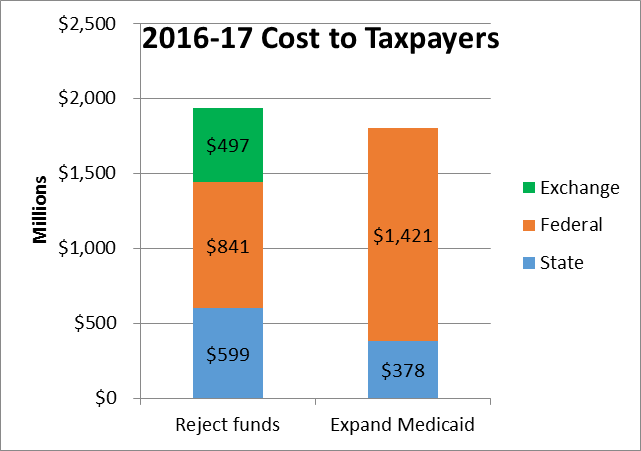 When all costs are considered it appears that the total tax burden would be reduced if Wisconsin accepted the expansion funds, as the earlier graph showed. One reason is that Medicaid is known for driving the hardest bargains with providers. They were not, by and large, angry about their health care; they were simply afraid they will be unable to afford coverage for themselves and their families. They trusted Mr. Trump to do the right thing but were quick to say that they didn’t really know what he would do, and were worried about what would come next. They spoke anxiously about rising premiums, deductibles, copays and drug costs. They were especially upset by surprise bills for services they believed were covered. They said their coverage was hopelessly complex. Those with marketplace insurance — for which they were eligible for subsidies — saw Medicaid as a much better deal than their insurance and were resentful that people with incomes lower than theirs could get it. They expressed animosity for drug and insurance companies, and sounded as much like Bernie Sanders supporters as Trump voters. In his letter, Walker points to the risk that the federal government will renege on its promise to pay a higher share of the cost of expanded Medicaid. In doing so, he ignores the political risks to both the exchanges and to Medicaid, which his plan relies on. For instance the plan promoted by President Trump and Speaker Ryan would have made purchased insurance unaffordable to many of the low-income people in Wisconsin who lost their Medicaid coverage. After the replacement bill pushed by Trump and Ryan collapsed, both men predicted that Obamacare would “explode.” This contradicts the opinion of most less partisan observers, including the Congressional Budget Office. The trouble with this less sanguine conclusion, however, is that Obamacare is now under the Trump administration, which has a number of opportunities to encourage a meltdown of the exchanges. Several of Trump’s comments suggest he might be tempted to encourage such a failure and blame Obama and the Democrats. Whether or not Trump could create an “explosion,” he could certainly make the markets more shaky—or conversely shore them up by reducing uncertainty. By contrast with the insurance exchanges, absent a change in the law, there is much less the Trump administration can do to sabotage a Medicaid expansion. As a single payer system, it is not susceptible to the feared death spiral. We’re going to have insurance for everybody. There was a philosophy in some circles that if you can’t pay for it, you don’t get it. That’s not going to happen with us. His proposed replacement fell far short of these promises to people who voted for him. Finally the Wisconsin model is a political and economic dead end for other states. It only worked as well as it did because Wisconsin was already one of the states most successful in offering insurance to its residents, which resulted in Medicaid coverage for people who also qualified for the exchanges. It is unlikely that any states that did not take the expansion funds could afford to follow Wisconsin’s lead. Having stated these facts, I trust you will understand the humor I find in receiving budgetary advice from a member of Congress who is asking me to have Wisconsin taxpayers buy into Obamacare, which itself has increased the federal deficit by billions upon billions. It is perhaps futile to point out that this assertion was rejected by PolitiFact, among others. What part of math doesn’t Walker get. Is it billon or a million? The truth is Wisconsin could have used the billion $$ Walker rejected to help with our budget. The truth is Walker played the Obamacare program as good as any governor in the country. We should be thanking our lucky stars his team understood the game as well as they did. They played the ACA like a Stradivarius…. If you do not believe me look at how the game is played. Wisconsin did not expand Medicaid which means that coverage is affordable for the low income in WI between 100% and 138% of poverty which is the cut off between expanding Medicare and not expanding Medicaid. If you do not believe me just visit http://www.healthsherpa.com and run your own zip and incomes of $12,000.00 to $16,400.00 in WI. For a 55 year old in Wisconsin/ Brown County making $16,399.00 a year (the cut off of 138% of poverty or Medicaid) they would get a Plan for a whopping premium of $0.00 per month. What do they get for that $0.00 premium? A $0.00 deductible with a $0.00 doctor visit copay. The kicker? They could have a $700.00 maximum out of pocket due to coinsurance if they are hospitalized. Are we seriously saying that the benefit that person gets on Badgercare without getting Wisconsin into the quagmire of expanding Medicaid and all of the fiscal future uncertainties that would include for Wisconsin taxpayers is better than that plan for a $0.00 premium? Try being self employed and making $48,000.00 a year. Then your premium goes to $630.00 per month, your plan goes to a $50 copay, $5200.00 deductible and a $7150.00 out of pocket. And the kicker is you pay taxes and are funding the rest of Obamacare. The first person probably is hardly paying any taxes. So expanding Medicaid is a good thing why and for whom? Are you aware that Badgercare and Medicaid are the same thing? An unmarried childless Wisconsin resident making even $12,000 is ineligible for Medicaid (aka Badgercare) because they make more than the Federal Poverty Level (FPL), and Badgercare is only for people making less than FPL. The plan you saw on Healthsherpa for this person is NOT Badgercare; it is subsidized insurance sold by a private sector insurance company. Even with a zero premium and zero deductible (thanks to federal subsidies), it still costs that person more than expanded Medicaid would—Medicaid would not have the $700 hospital co-pay. All ACA policies include FREE preventative services (like an annual physical, cholesterol screening, and immunizations) even if you have not met your deductible. I appreciate your response but you are actually supporting my exact point. A person making under 138% of poverty actually gets a very good health plan for a $0.00 premium and is not on the Medicaid/ Badgercare system which puts WI tax dollars in jeopardy. In fact, I think we could argue that the provider community would rather be paid the reimbursement rates for treating people in that segment on a ‘commercial’ ACA plan rather then being reimbursed at Medicaid reimbursement rates. It is much more profitable for the provider community to be paid nonMedicaid reimbursement rates. The example I used was a 55 year old in Brown county, not a 25 year old in Brown County. Your rates are lower because Obamacare is age rated and if you remove the tax credit for the person making 48k a year they are paying the full cost of the premium without an advanced premium tax credit. Therefore, your rates for a 25-year old were quite a bit lower. The people we would be talking about making 138% or less of poverty would all be getting tax credits and out of pocket reductions. My point for the 48k example was to show the true cost of insurance without tax credits for the rest of the state population that is in a higher tax bracket and paying the bill for Medicaid and advanced premium tax credits. My point is really this. A person can get a fantastic health insurance plan in WI without expanding Medicaid if they are in the 100% to 138% of poverty level. The numbers that I ran in my previous comment illustrate that reality. If you look at my previous example, a person making $16,399.00 per year or about 138% of poverty in WI is not on Medicaid. Does not pay any insurance premium for a commercial plan. They do not have an office visit copay to see a doctor, they do not pay a deductible to go to the hospital, and their maximum total out of pocket for a year is $700.00 for all costs: Rx, doctor, hospital, coinsurance, etc. Essentially, it is not easy to hit $700.00 in out of pocket costs. Now take the poor working making 48k a year. In your example that 25 year old may be lucky enough to have a plan for $230.00 per month with a $7,150.00 out of pocket. If they have a lot of claims that is 14.89% of their income. 7150/48000= 14.89 Let’s not forget they have to pay premium every month, too. $230.00 x 12 which only makes it worse. I am not even sure it is worth doing the math, the point is clear. Therefore, what is the point of expanding Medicaid except to put more ‘easy money’ into the state’s coffers which may create a tax albatross in the future? The Medicaid money is not ‘free’ it never is. 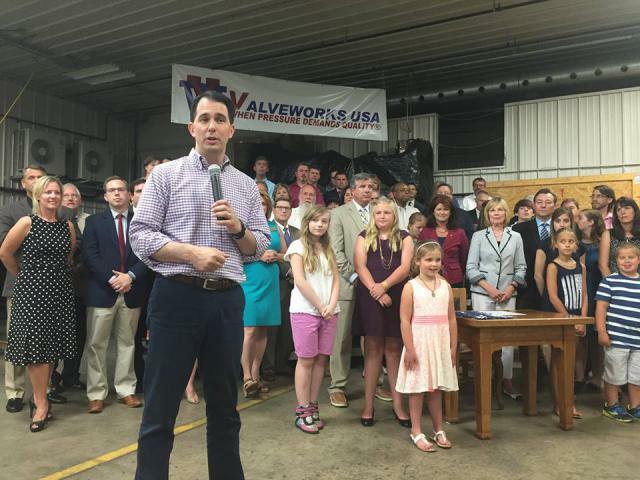 Walker’s team has simply done a great job with Obamacare and implemented it like a genius. I think it is time for people to understand how Obamacare really works and get off the expand Medicaid pulpit. You minimized the costs for a hypothetical 55-year-old, unmarried, childless Brown County man making $16,000. You correctly said he could get an ACA policy with $0 premium, $0 deductible, $0 (non-specialist) doctor visit. You didn’t (but could have) also mentioned that he also gets free prescriptions (for generics, anyway). But he would get all that under Medicaid, too. And the similarities end there. Under the ACA plan, this man must pay to see a specialist, visit an ER, use an ambulance, or to get a non-generic drug. He will also pay 100% of the cost of an out-of-network doctor or hospital. None of these costs would be incurred with Medicaid (Badgercare). Yes, those costs (except when out-of-network) are capped at $700/year, but that’s still $700 more than under Medicaid. So, yes, I am “seriously saying” that the benefit a person would get under expanded Medicaid is better than under ACA (even with all the subsidies). Your other example (55-year old Brown County man making $48,000) is irrelevant to this discussion of Wisconsin accepting expanded Medicaid since his costs wouldn’t change. Here is the part that is relevant. Healthcare is not free and neither is health insurance. Medicaid/ Badgercare has a cost, maybe not to the person on Badgercare but it certainly has a cost. Who has to pay that cost? Taxpayers. As a person that pays taxes you are trying to convince me that Badgercare should be expanded because the people making less than 138% of poverty are not being properly cared for under our current system. I disagree with your premise because I think that they are being offered a pretty good deal, as I had outlined in my data. How many people would gladly take a plan with a $0.00 premium ($23.00 if you are 25 years old), $0.00 copay, $0.00 deductible, and $700.00 out of pocket? I think a lot of people would jump at that offer. Yet, we have people in this country who think that is a bad deal. Could you argue that there are better deals in other states that expanded Medicaid for those making less than 138% of poverty? Yes, you could make a very valid argument that those making less than 138% could be paying a lower out of pocket in another state. However, I believe that over time those states are going to have a rude hangover when the Federal lawmakers start to carve up Medicaid budgets and then the bills start coming home to the states and their tax payers for payment. I am sure you disagree with my doom and gloom perspective of the Medicaid cuts I see coming. However, who would have thought that 64% of the children born in WI in 2014 would be born on Medicaid/ Badgercare when it was first passed in 1965. Back then it was a very tiny part of the the overall bill that included Medicare. Medicaid was just an after thought that hardly anyone was going to qualify for and it was going to have very low costs. The reality is that once you open the bottle up, there is no going back. We have a good system today, it completely fits with the ACA, and it is saving WI taxpayers money and will really show its genius in saving money over the long term. We have a good system today? Hahahahahaahaaha. Even if you have health insurance, going to the doctor is like flying United. You never know what it will cost or if you’ll actually get what you paid for. How does Medicaid expansion cure the United Airlines comparison? Government airlines will run better? Apparently, you don’t have much experience with health care billing, it’s worse than United customer service. Tom Madden, stop being obtuse.